With school starting I’ve been spending a lot of time in my classroom getting it ready so I haven’t had a lot of time to post here since returning from my trip down south. I did pick up a box of 2016 Stadium Club which was a blast to open. I’ll gladly post a review of it if you would like. …my 1998 Flair Showcase Row 0 set has been completed! Any of you that open boxes, know that there is risk involved when it comes to this hobby. Today box 3 of Ionix came in the mail at the price of $45. I’m going to keep this short and simple…it was by far the WORST box of this product I’ve ever opened. No parallels, no major inserts, and out of the 3 inserts I received were duplicates from the last box! Yeah I feel like I just wasted $$ but that’s the risk you take. Safe to say that unless a box of this pops up for super cheap, that this will be the last box of Ionix I purchase 🙂 I am eyeing a box of 2000 EX or 2000 Showcase next. 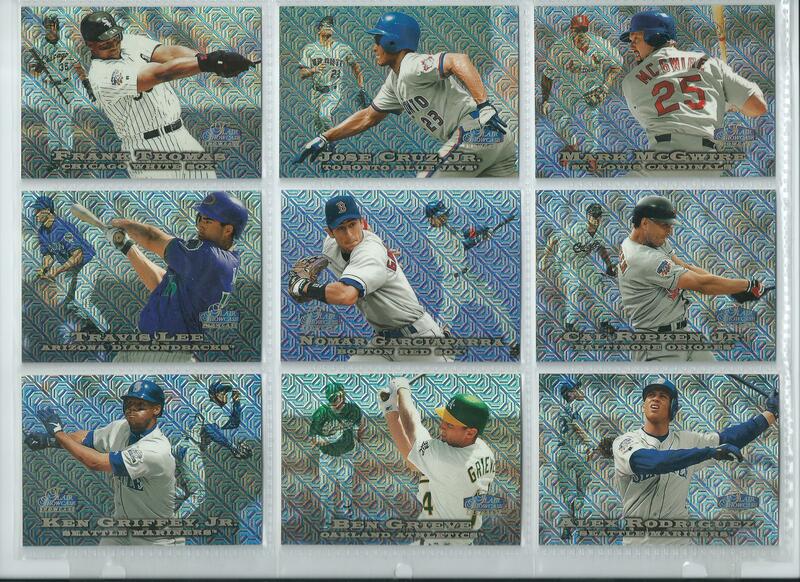 I’m going to lick my wounds and post and update as to how many base sets of the 60 base cards I have from 3 boxes. While it ended on a sour note, it was sure exciting to find a Warp Zone in box #2. Stay tuned for an “Old School Hits” post that comes from E-X2001. I was lucky enough to find something extremely rare that a member on Freedom Card Board was selling. Pretty excited to write about the card here by the end of the week. Before we all get back to the grind tomorrow, I wanted to give some of you reader’s a preview of what’s coming within the next couple of weeks! First off, hopefully you’ve had the chance to read through John’s 1996 SPX Baseball Box Break. It was one of the better boxes you’ll see of the product and may even get you looking for singles or a box online. I opened this Blog’s second box of 2000 SPX Baseball, and it was a dandy! let’s just say a future Hall of Fame Auto was waiting in pack #6 of 18 that made me happy. Stay tuned for that review tomorrow before game 5 of The Finals. Also on the way are 2 Becketts. I thought it would be fun to look back at a Beckett from 2001 and see how much some of these Old School cards were worth when they were a tad more popular before Jersey cards and Autographs became the staple of card collecting. Lastly, a seller in Canada was selling a large amount of Old School boxes and I was able to score 3 boxes at a cheaper price than any store online (1999 Ionix, 1999 Thunder, and 1999 Bowman Chrome Series 2). So plenty coming up soon as well as a couple “Old School Hits” posts from my newly arrived Alex Rodriguez collection from comc.com. I hope everyone has a great week and as always, please let other collectors know about this blog that John has worked hard on. There’s ton of box breaks to look through and enjoy among other interesting posts!